Meet Joshua Michael Allen, world's worst bike messenger. He delivers the goods, and he delivers an attitude. One day he gets caught up in a monster attack and is changed. Transformed into a freakish creature with purple skin and terrifying mouth, he's consumed by a hunger that can be sated only by eating the life force of others. And then only temporarily. Barely a month later, then, he's falling, expecting a quick blast of pain to bring oblivion. But this is Metropolis, and Superman's passing by. He saves the Parasite, but in doing so gives him his first taste of real power. He absorbs Superman's energies, and regurgitates them. But while he has the Man of Steel's power, he lacks his experience, and soon Superman has him in Belle Reve, the pen for the super-powered. 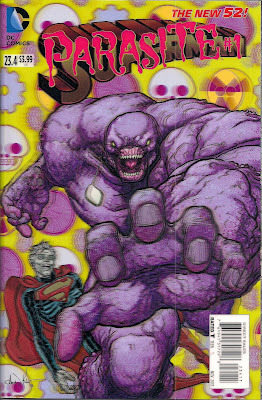 The tie-in to Forever Evil #1 is there, but we don't meet the CSA in this issue. This is the Parasite's show, and quite a show it is, showing us who Joshua Allen was, and what he becomes. This comic is what I needed. After the grimdark nonsense of Joker's Daughter, here's a Villains' Month special that gives us grisliness with a light touch. The Parasite's acts are no less shocking than those of Duela; heck, he kills where, so far as we know, she hasn't. 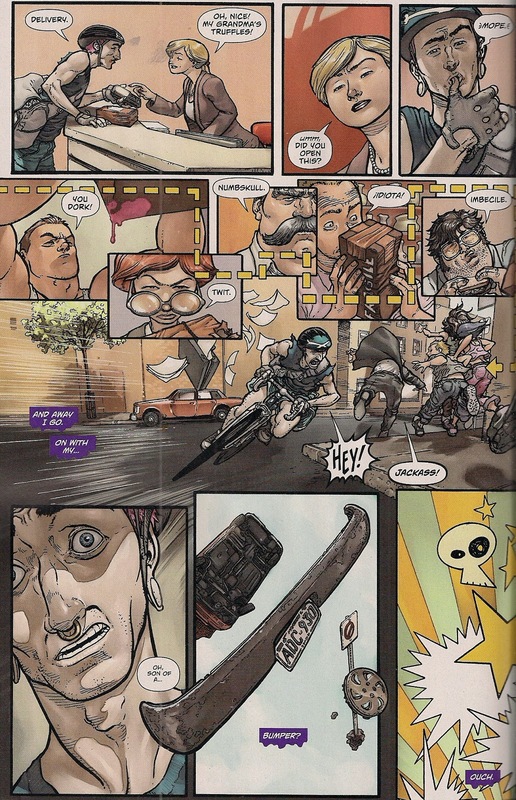 But Aaron Kuder, providing the story as well as the more expected art, skillfully weaves humour into his work, and economically sketches in Allen's personality so that we know him well enough to sympathise with his plight. At least initially, when he doesn't know what he's doing, can't control his body. While there is darkness, my takeaway from this book is a big cheesy grin. Kuder the writer gives us huge monsters, a powerfully competent Superman, amusing background players and a chillingly witty close. He frames the origin sequence with skill, showing us the supposedly perfect world of Metropolis from the perspective of the little guy, someone who'd just like to go about his day without running into the kind of trouble Superman attracts. In this case, a 'giant ... booger... monster'. The script delights from beginning to end, with witty notes that contrast with most of DC's output these days - yes, it's a scary world, but observing it with a wry eye may just make it more bearable. Kuder the artist produces page after page of stripwork to hearten the soul, beginning with the eye-popping 3D cover and never letting up. Allen is a nice creation, and visually something more than your average comic book guy, who's good-looking and characterless. 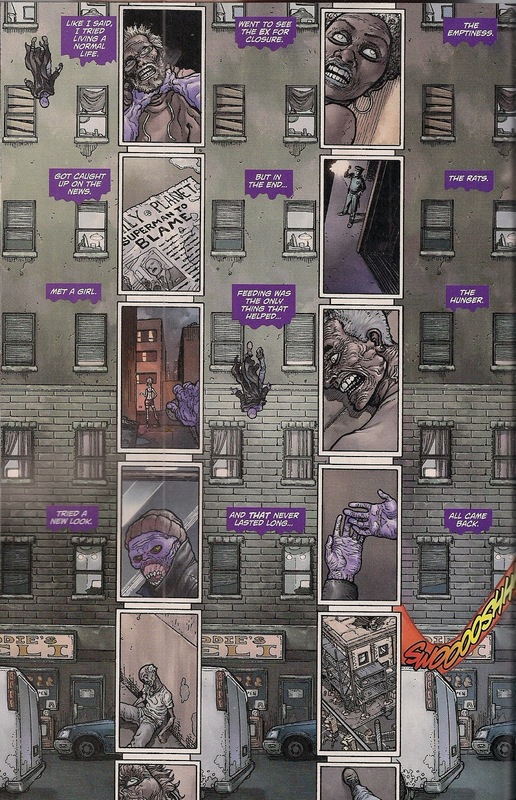 Depending on his physical state, the Parasite veers between pathetic and horrific, lavender mummy and purple people eater. And Kuder's strong Superman bodes well for his coming Action Comics run with Greg Pak writing. 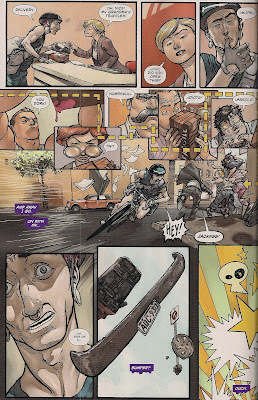 Colourist Tomeu Morey also deserves a nod for beautifully applied, considered tones. This man understands comics - and more importantly, people - and I hope he produces more scripts. I've a feeling we're in at the start of something special here. I'm pretty sure I saw this guy in an X-Files episode. That rings a bell but I can't quite place it. Consider me tormented. Even though there is an X-files episode called "The Parasite" the guy we're thinking of is from..."The Host" And damn if he wasn't creepy looking! I like the underwear model original, too! Although I admit that I'm kind of bummed that this Parasite isn't RM Jensen or Rudy Jones, but he seems to be living up to namesakes and has nice villain origin and personality, so I'll give this New52 character a chance and hope for the best out of him. Hmm, JM Allen...Any relations to a Barry Allen, perhaps? By the way this may sound strange, but how do you prefer Parasite's look costume-wise? Torn Pants like in Superman: Earth One? Bright Green Tights like in Silver Age and Secret Origin? Or, you know, Totally Naked like in the Animated Series and All-Stars Superman? Given that there'd been two Ps already, I'm OK with a new guy in the Super Sad Sack role. I wondered about Barry Allen too - we are such demented fanboys. And Silver Age green all the way, I like that purple broken up. 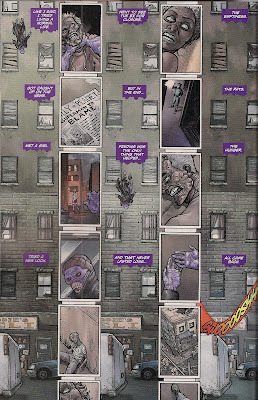 I do love Kuder's art and picked up on the building page as brilliant in design. I also like the twists and turns this plot provides around the character, having me feel first sympathy and then disgust for him. Can't wait to see Kuder on Action. I wonder if, having seen this issue, Greg Pak may enlist Kuder to help with the plotting? DC has a great history of too writer/artist teams, and it's always good to see a new one emerge.